The above racing team consists of my paternal grandfather, George Washington Longenecker (1864-1951) and one of his American Standardbreds. Grandpa George may be considered an obscure poet; but he was far from obscure in Neillsville, Wisconsin where he served for decades as a preacher in the 1st Congregational Church. Along with “pastoring” (actually Congregational preachers* are called “Reverend” rather than “Pastor”), Grandpa George raised American Standardbreds and competed in sulky races at local fairs. This activity raised a few legalistic eyebrows in the small Wisconsin community—probably due to the possibility of spectators gambling on the races. But Grandpa’s recreational passions involved horses and poetry, not money. Having made poems ever since I can recall and pursued a lifelong study of poetry as fine art, I need to mention that most literary poetry aficionados would consider my grandfather’s verses to be doggerel. Although Grandpa was raised on classical literature, his course of study was theology—not the fine arts. Like many Congregational Reverends in his era, he graduated from Ohio’s Oberlin Seminary. Grandpa George loved the Lord Scripturally, with all his heart and mind. His poems reflect his love, and that’s good enough for me! My grandfather also loved music, specifically the great hymns of the Christian faith which he played on his violin. Much of Grandpa’s poetry contains the cadence and meter of a hymn. No feature concerning Grandpa George would be complete apart from mention of his beloved life partner, Emma Rosina Ernst Longenecker (1866-1952), my grandmother. In past blog entries I have celebrated Grandma Rose who was known for her abundant garden produce, homemade bread, and frequent litters of kittens generously shared with people around town. *A contemporary novel, GILEAD by Marilynne Robinson, centers on three generations of small town Congregational Reverends from the Civil War to Mid-20th Century. I was riveted to this book and want to read it again, as it reflects my roots. Potentially classic, GILEAD is a quietly-powerful piece of fiction. Marilynne Robinson’s storytelling gift is poignantly beautiful. Two more of her novels, HOME and LILA, form a trilogy with GILEAD. 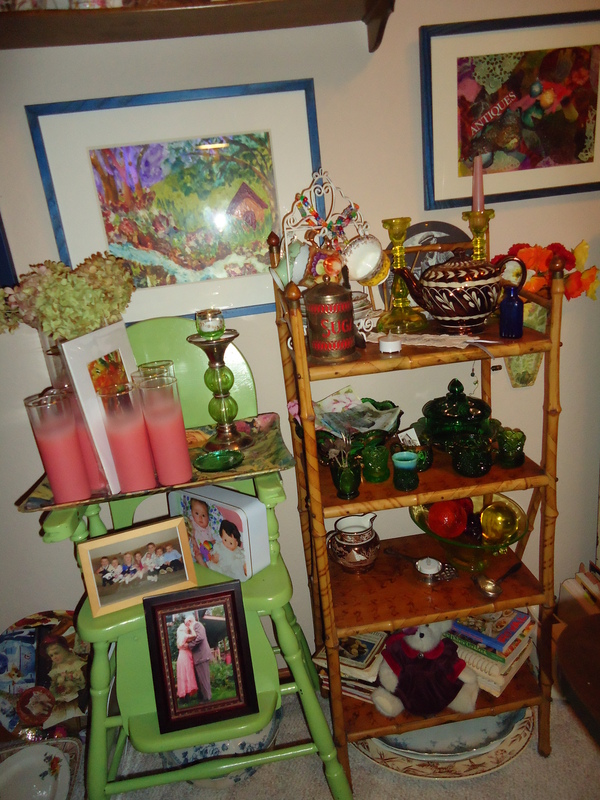 Musings on antiques, wonderful junk, and homegrown art . . .
At a recent social occasion, a young friend shared that she simply can’t stand the word “beige”. She said it’s so “You know, beige!” I agreed that “beige” is indeed a boring, generic word when one could qualify with something more colorful like “pale nutmeg”, “1/2 whole wheat,” or “overcooked chicken thigh”. Anyway, I got to musing about words that I “can’t stand” (I say that instead of “hate” which my parents taught me never to say except when referring to major issues like war, disease, race discrimination, etc). I came up with two words, and both of them begin with a preposition: “update” and “downsize”. To me “update” is an unimaginative, harshly pedestrian word smacking of anything that would threaten to ratchet me from the 19th and 20th centuries where I felt at home, to the 21st where I live—although that hasn’t yet made a dent in me and I hope it never will! And I knee-jerk even more, over that intimidating verb—“downsize”! Of course some downsizing is essential when it means moving from a large home to a smaller one (we’ve done that three times in thirty-two years—paring a bit here and there without diminishing our penchant for acquiring antiques and junk). Lack of space is a valid reason to delete some of one’s stuff, to make more space for collecting at the other end! Also, it makes sense to give our children and grandchildren some family heirlooms and perhaps some silver, china, or crystal—so we can see them enjoying these items before we depart. 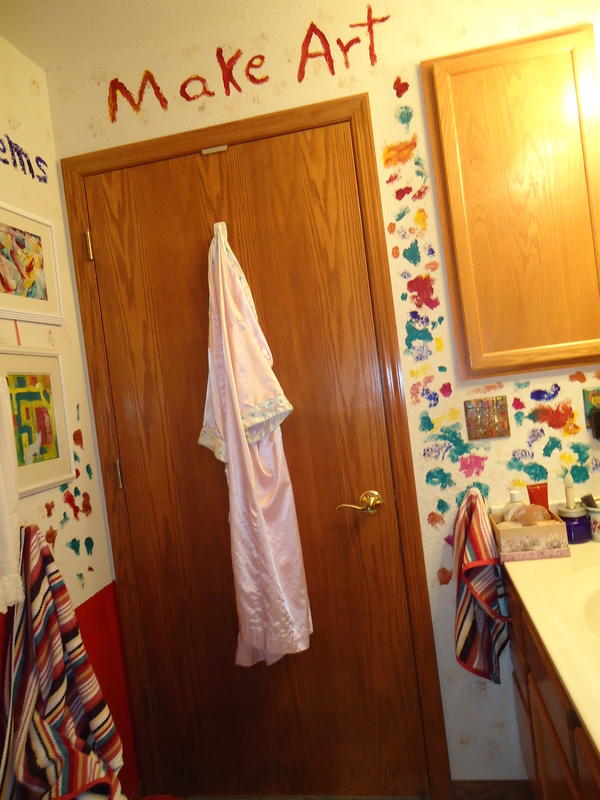 Obviously, when “things” or “clutter” become disorganized in a home—or when they prove burdensome and inordinately time consuming—then it’s good to take drastic action. Also, we need to run an inventory if things are overly important in our lives. We are never to idolize stuff! The currently popular fad of downsizing may be partly due to that horrible contemporary lack of commodious attics in which to stash the extra detritus of bygone years. What a loss to the human race and quality of living—although heating Victorian houses might not appeal to many of us. But I think the contemporary downsizing syndrome implies more than the lack of an attic. Some late 20th century sterility has crept into the American pop mentality. And by now, nearly thirteen years after the turn of the century (which to me will always mean from 1899 to 1900) our culture has degenerated full-throttle into the crazed concept that everything has to: 1) move fast, 2) be bio-degradable, and 3) be “easy” to maintain. Those souls who simply cannot live with dust, rust, stains, or tatter, will definitely choose advancing into the 21st century—perhaps in tandem with some who can’t sit still or walk slowly, but rather need to be metaphorically catapulting from coast to coast with a brief lay-over in Minneapolis or Chicago. Fortunately, however, there are others who will always resist the latest trend. We are those intrepid and dauntless anachronisms—suspended in time, while happily preserving the artifacts of other eras. We anachronisms don’t care two hoots when our stuff gets dusty—although, because I enjoy the process, I actually dust (most) everything twice (or maybe three times) per year whether I need to or not! 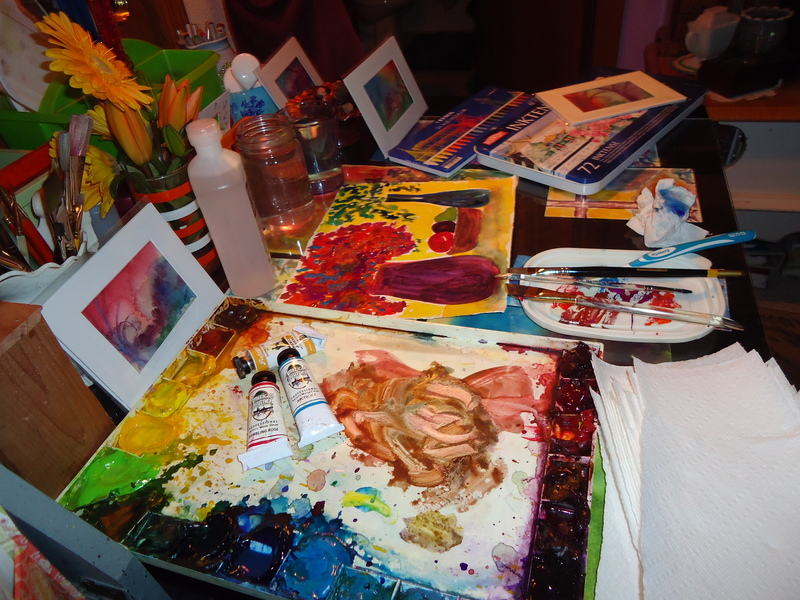 I love rust, the stains of antiquity (barring spilled food and dog messes), and tatters. I do draw the line at mold, but only because I have a chronic sinus infection and asthma. Above you will see a view in our current home which is much smaller than past digs, yet equally packed with fun and funky stuff—along with whatever heirlooms, china, silver, and crystal we haven’t yet given away. 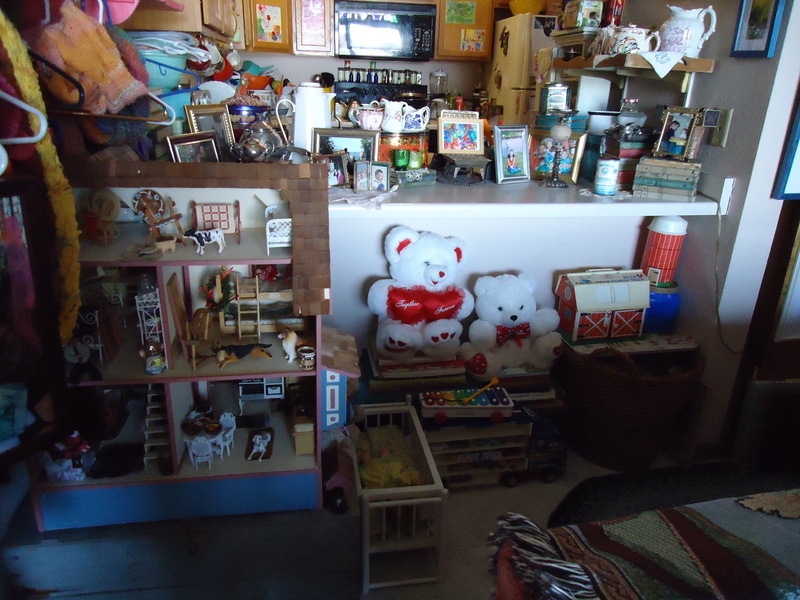 When it comes to plain old wonderful junk, and of course home grown art, the population is ever-increasing! Our gardens and walls will vouch for that! We are always “upsizing”! I didn’t say “upscaling”—that would be stressful and no fun at all. Just upsizing! Our rooms may diminish in numbers, but never in that overflowing variety of ambience loved by that unique breed of folks known as collectors! Margaret L. Been, ©2012—yet fondly preserving slower years! Life is an ongoing exercise in holding for awhile, then letting go. Currently I am letting go of a beloved young family: our grandson, Joshua, his wife, Kelly, and their precious children—Ethan, Cole, and Ella. These Valentines (that is their last name!) are moving to California, where Josh has accepted a new job. 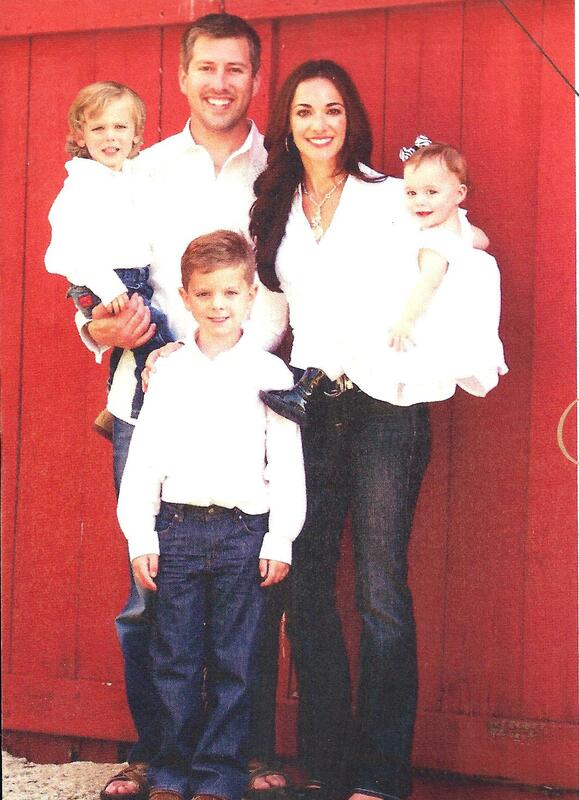 Josh and his family have been our neighbors for the last two plus years, here in the northern reaches of our county. They are the kind of people who show up and sit quietly by your side when you have been rushed to Emergency. We’ve stashed away a treasure trove of memories with these young people—pizza outings, birthday celebrations, strolls in the park, and lots of ice cream occasions. I have shed tears over losing this family, and I’ll undoubtedly shed more tears. Yet I smile to think of Kelly enjoying San Diego. Kelly and I are alike; we love warm weather! I often reflect on how radical it was back in the 1800s when Easterners went West, facing incredible hardships and dangers. Even more life changing was the uprooting of millions of immigrant families who came to our land from other continents, for a fresh start and the hope of a better life—or, as in the case of most of my ancestors, for religious freedom. We can concentrate on thinking with all we have, yet we cannot begin to comprehend what those early settlers experienced—let alone the courage they displayed. So California is not that far away, and it is not inaccessible! A few hours by air. Yet it sounds like the other end of the world to me, now that flying is no longer one of my favorite things! I would relish a long trip on the Amtrak, but sitting on a train is not Joe’s idea of fun. We’ll see what we can dream up. Meanwhile our loved ones will be back to visit, with so much family in Wisconsin. 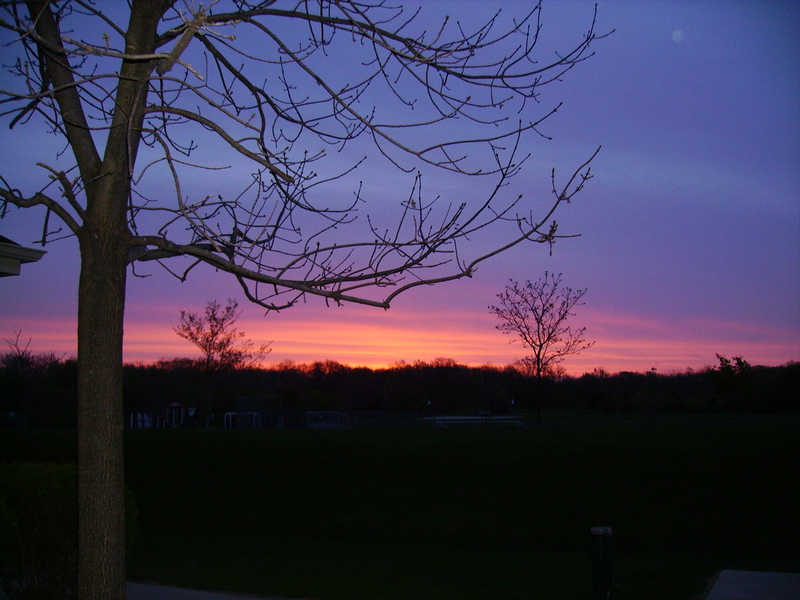 Yesterday I savored some mellow moments in the little town of Delafield, just 5 minutes from our home. My first stop was a yarn store where I bought baby fine cashmere/merino blend yarn for seaming my knitted sweaters. 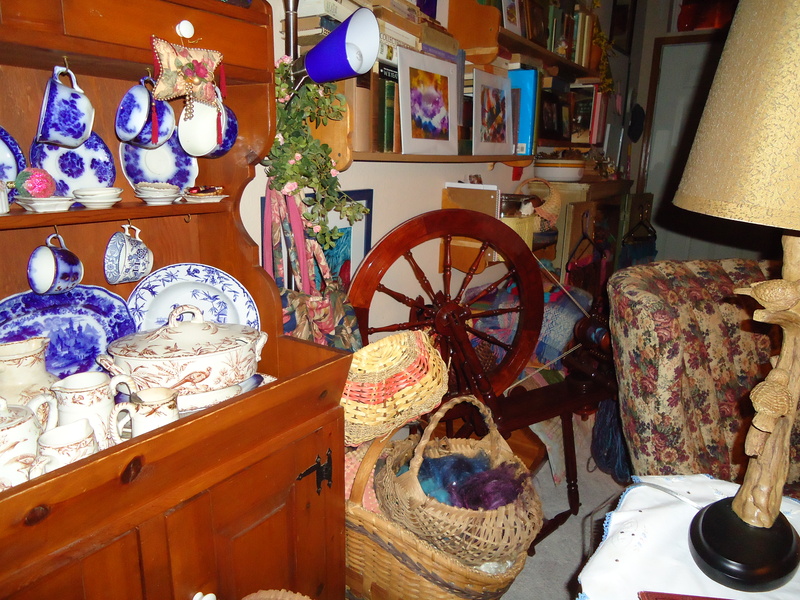 From the yarn store, I went up the block to an antique shop in an old Victorian era home. I’ve been visiting this shop since the 1970s, when the (then young) husband and wife who own the shop had just moved in. In the beginning, they sold out of the dining room on the main floor of their home. That was exciting, because as well as being able to browse in a gorgeous period dining room, one got a glimpse of the adjoining living areas—all packed with family treasures. 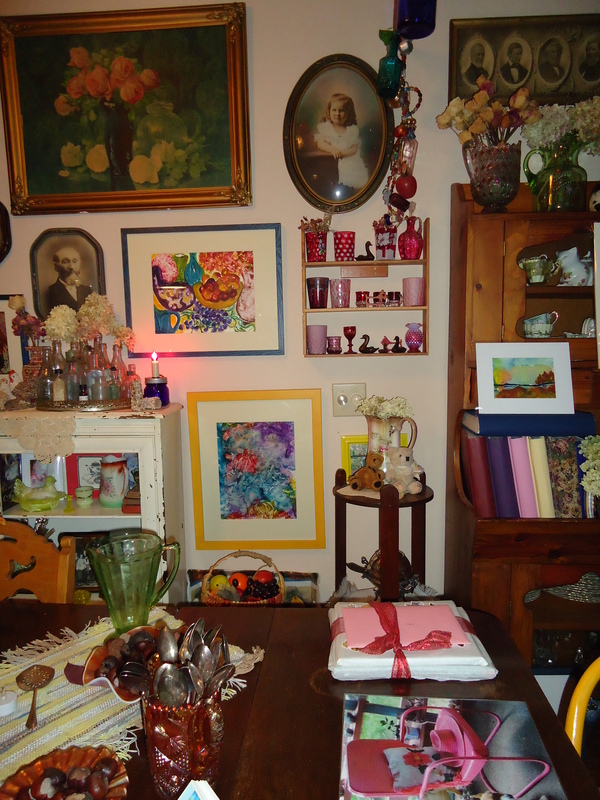 Now the shop is in 2 cozy basement rooms, also packed with treasures and ambience. What a treat to know these people. Like me, they grew up with antiques, and their appreciation goes far beyond the mundane level of market value. Enjoying antiques is all about cultural history, family roots, a love for beautiful craftsmanship, and the art of filling space with objects of interest—things that really mean something! 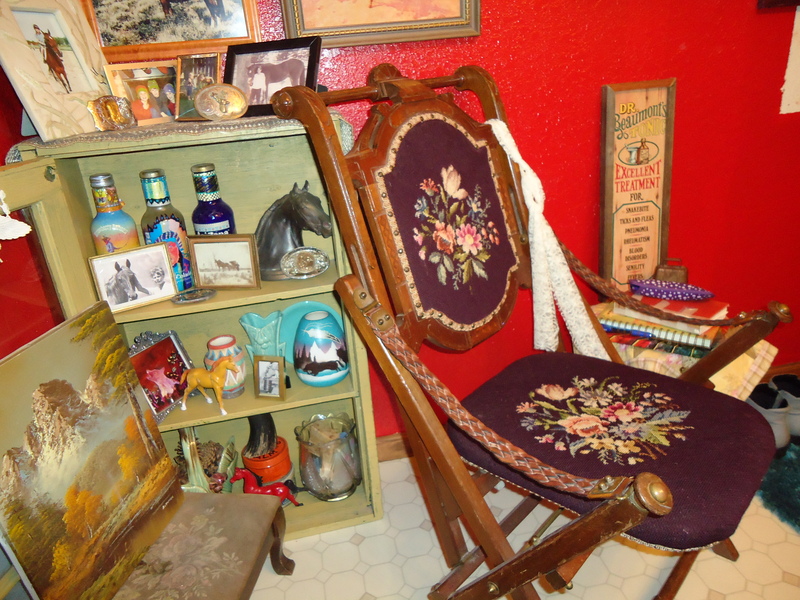 A home antique shop is nearly an anachronism in our current age of shopping malls. When I was a child, many of the antique shops were in homes—with the exception of galleries and outlets in cities. When my parents and I “road-tripped” we wandered through the small towns, as freeways and by-passes were unheard of back then. Residential neighborhoods contained homes with a sign in a window, advertising “ANTIQUES”. I’ll never forget the wonder of entering these private sanctuaries overflowing with porcelain, glassware, old kitchen gadgets, and boxes of sheet music and books. I was taught not to touch. Nothing could tempt me to violate that rule, as I didn’t want to jeopardize my special privilege in being allowed to walk around in the shops. With my hands clenched behind my back, I relished a feast for my eyes. Bits of information were given out here and there by the shop owners, and I absorbed all I could of that enchanting world of antiques and collectibles. 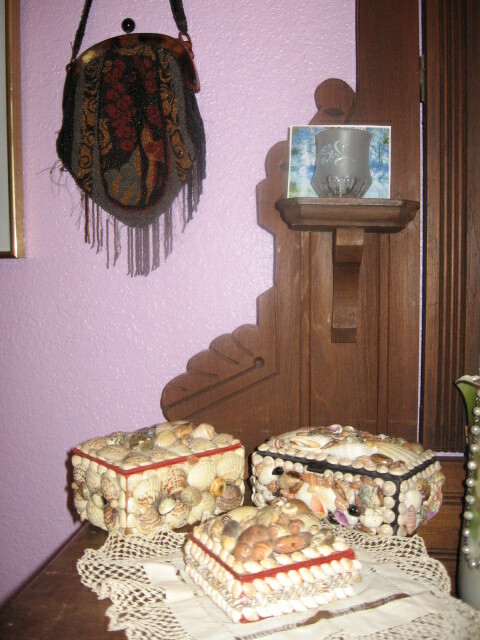 Pictured above, is my small collection of shell art jewelry boxes. 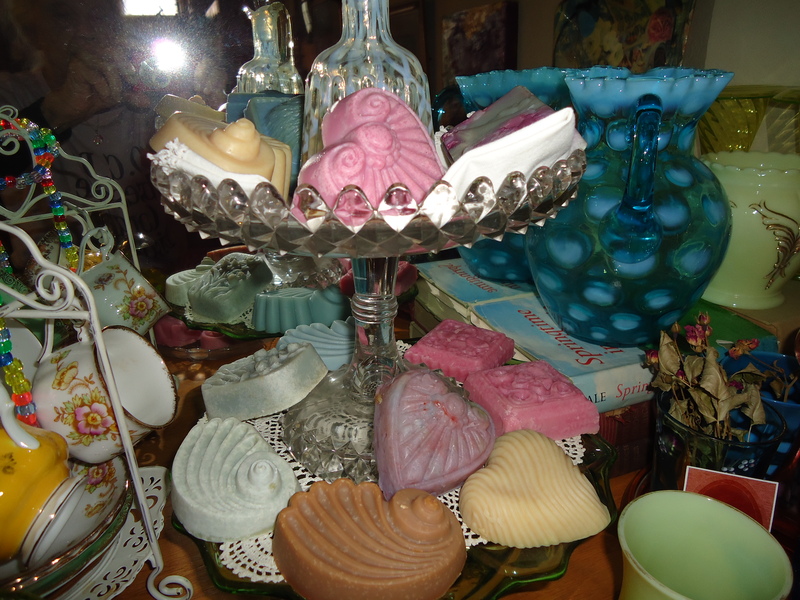 I purchased the center one yesterday, at the home shop in Delafield. The others were acquired via EBAY—a fun place to shop, but not nearly as satisfiying as browsing in a store! The vintage evening bag, hanging above the shell boxes in the photo, was a gift from one of my nieces in Colorado Springs—my nephew Andy’s wife, Sandy. The elegant handkerchief under the center shell box was carried by my Grandma Rose on her wedding day in 1892. The toothpick holder on the little shelf was my VERY FIRST COLLECTIBLE. It was given to me when I was 6 years old, by an antique shop proprietor who was impressed by my quiet, “hands-OFF” behavior in her store. The toothpick holder has tiny forget-me-nots painted on it. It has gone with me nearly everywhere all these years, with the exception of the time I lived in university dormitories—definitely not places for treasures. The forget-me-nots remind me of never-to-be-forgotten mellow moments!